Days: September 28-29, 2013 NOTE: this event has already happened, find current-year events on the events page. 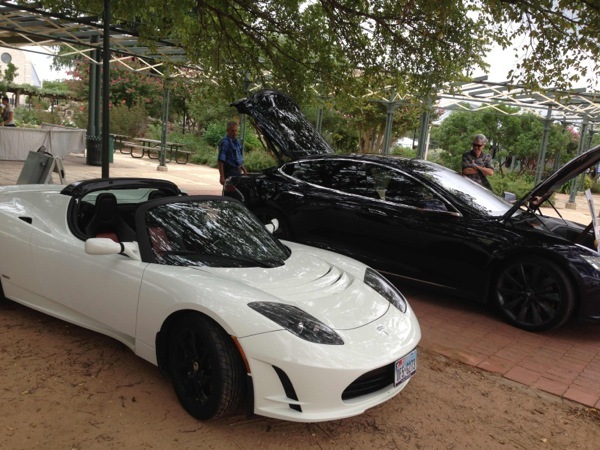 The plug-in event was part of the larger Renewable Roundup and Green Living fair held in Fredericksburg in the Texas hill country. In addition to an excellent panel with experts from solar, EV owners, incentive providers and those providing EV charging stations, the event led to some good news for EV drivers: a local flower shop owner with a shop on the main street agreed to put a charging station at the parking space in front of her store. In addition, others present made verbal commitment to put charging stations in Junction, Mason and at the Observatory in the Davis Mountains. Thus, if all these verbal commitments occur, a Tesla driver could go from San Antonio or Austin all the way to West Texas with charging stations within 150 miles.. Stay tuned for more info! September 27 – 29, 2013. Texans seeking healthier lifestyles and those concerned about drought and the environment have come to the Roundup yearly to hear national leaders and local experts; to participate in workshops and panel discussions and to enjoy creative events. The Roundup takes place annually the last weekend in September. Tickets are $10 per day, $12 on Saturday or $25 for a weekend pass. Regular "plugs" and an Electric Vehicle Charging Station will be available at the Roundup. In addition, Chevy Volts, Teslas and Nissan Leafs will be on display, as well as some custom-made EVs during the three-day Renewable Roundup. Can Electric Vehicles Like Tesla and Supporting Infrastructure Bring American Driving Back to the Glory Days? Electric Vehicles: Creating the Infrastructure is a panel discussion at the 13thAnnual Renewable Energy Roundup & Green Living Fair (The Roundup). Panel speakers include Ira Yates, Tesla Motors Board of Directors and David Brymer, Texas Commission on Environmental Quality (TCEQ). Other panelists will include Shey Sabripour, CEO of Altumaxis, SolarWing and SolarGrid Technologies, which seeks to bring new infrastructure like covered solar parking to the EV world, and representative from Austin Energy's Electric Vehicle Go EVerywhere program. The panel is scheduled for 11:30 a.m. on Saturday, September 28th. The Roundup takes place at Market Square, 126 West Main St. in Fredericksburg, September 27 – 29, 2013. The Renewable Energy Roundup is co-organized by Texas Renewable Energy Industries Association (TREIA) and Texas Center for Policy Studies (TCPS). Event precedes benefit TREIA and TCPS, two non-profits striving to increase understanding and awareness of renewable energy applications and to promote their wide use. For more details logon to www.TheRoundup.org, call 830-997-2350 or email: info@TheRoundup.org.